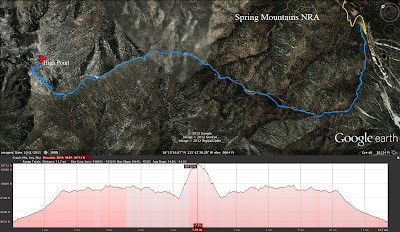 The last edition of the Friday Gang's training series for a climb to Mt. 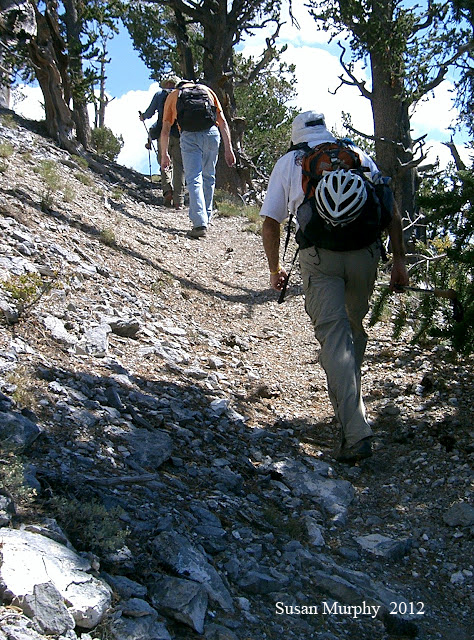 Charleston Peak was held today as eight determined hikers made it from the trailhead to the Griffith Peak summit and back in around six hours. 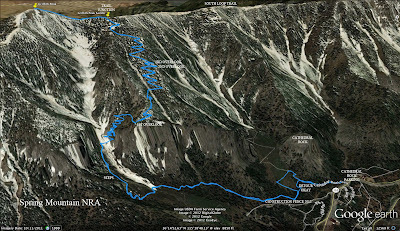 The ten mile out and back hike with 3800 feet of gross elevation gain was a real challenge for the gang and gave serious insight to what next week's adventure to the big Charlie peak will feel like. 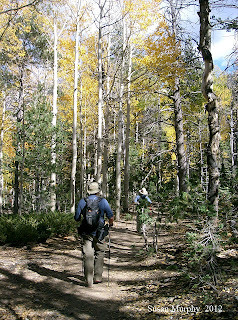 We began around 8:15am climbing the lower part of the South Loop with the sun creeping into the yellow aspen foliage. The start was somewhat slow and the hikers spread out at the steps area. 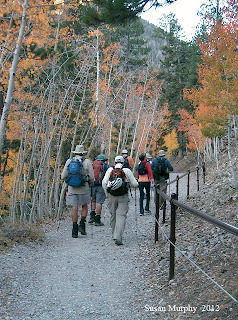 One by one, each hiker emerged from the aspen covered first set of switchbacks and we re-gathered at the first overlook which is situated at the tail end of the Echo Cliffs. The newbies were oriented by Chris as to what peaks were where and then hikers began meandering up the next section of the South Loop above those cliffs. We were not together but we were never too far apart as we passed the second and then third overlooks. 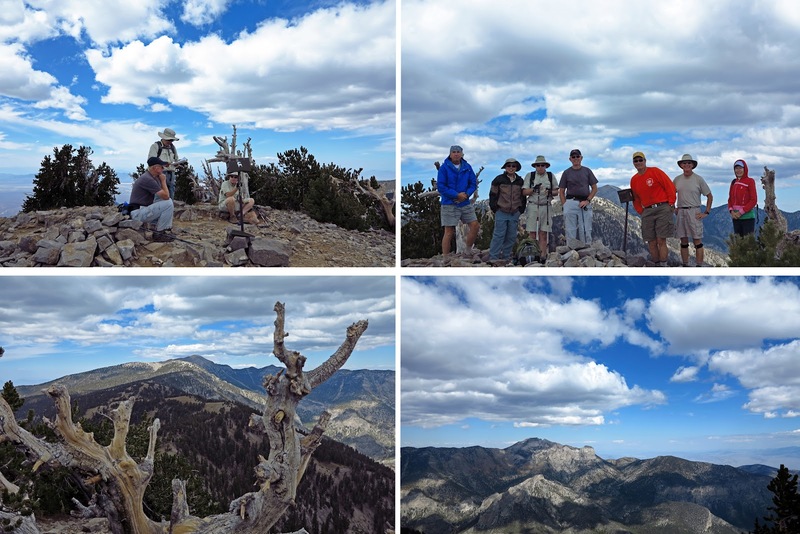 Photos were taken from these view points as our clear blue sky slowly began to turn into an overcast one. 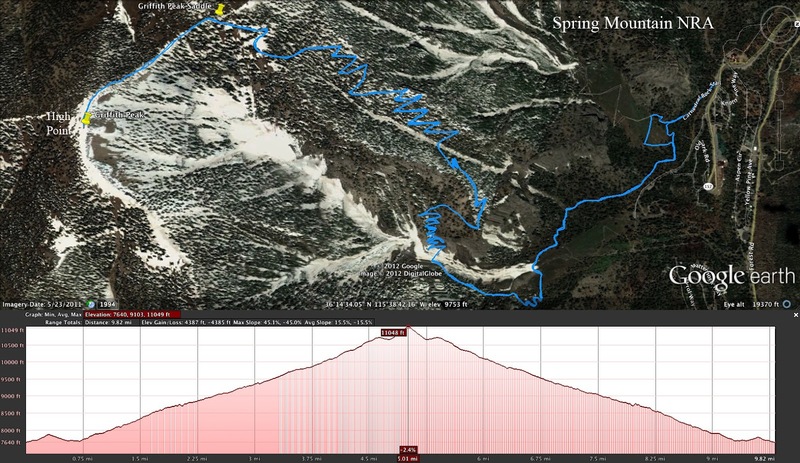 The third section of the climb went from the third overlook to the Griffith Saddle. Here, the trail switchbacks up through a hillside of tall trees that shaded the hikers as they steadily paced themselves past the close views of their target, Griffith Peak. 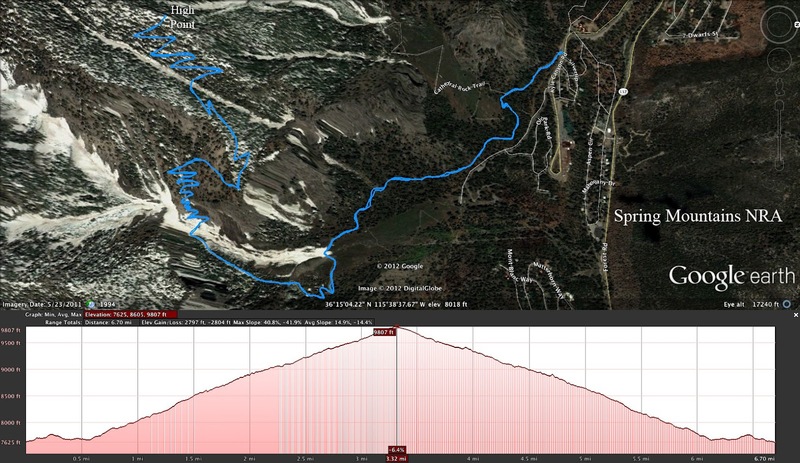 The last few switchbacks were a struggle but everyone made it up with energy enough to spare for the upcoming final climb. 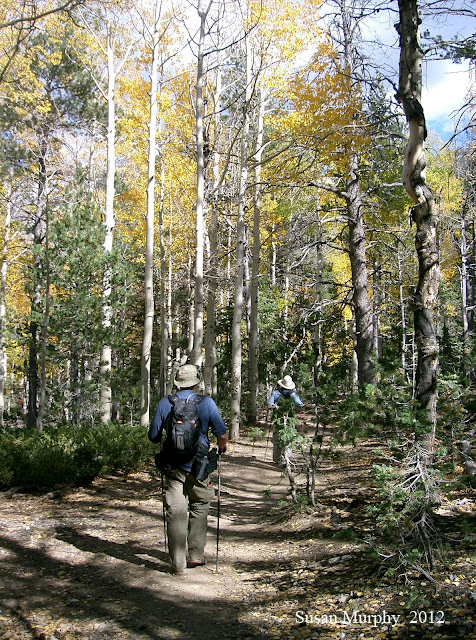 When the writer arrived at the saddle, four hikers were already there trying to wait for the remaining hikers. However, it was getting very cold as the front moved in overhead. The last three hikers were within sight below so the first four hikers decided to move on down to the final ascent, jackets and gloves donned. As the writer found her jacket and gloves, another hiker arrived from below and off they went. Turning left onto the Harris Springs Trail that connects the Griffith Saddle with the Griffith Peak approach trail, there is a small descent with views of Kyle Canyon to the left. Coming to a fork in the trail, we turned left and went up ... straight up. As Tom portrays in the photo to the left, even with the small switchbacks that were installed last year, the trail is steep and ridiculous after already climbing for 4.5 miles! But, with time, all can be accomplished! 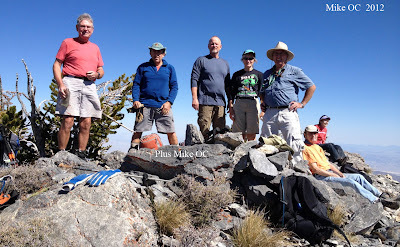 The eight of us stood atop the summit if only for a few minutes. The clouds were covering most of the Kyle Canyon area and we were cold! 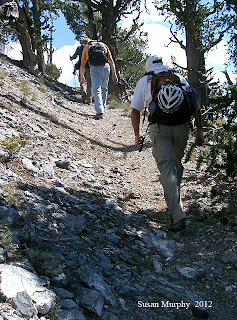 The descent began with that steep peak trail and we began slowly. The lead switched around from hiker to hiker as we went downhill ... sometimes fast and sometimes slow. The trail is in bad shape with rocks everywhere from being displaced by recent rains. 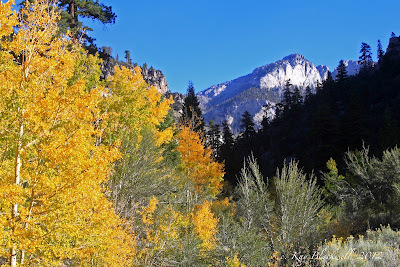 The cloud cover made the red and gold aspens "glow" in the dim light and there were many photos to be taken. After taking two or three decent breaks, we finished the hike with sore feet. Great day in the mountains! 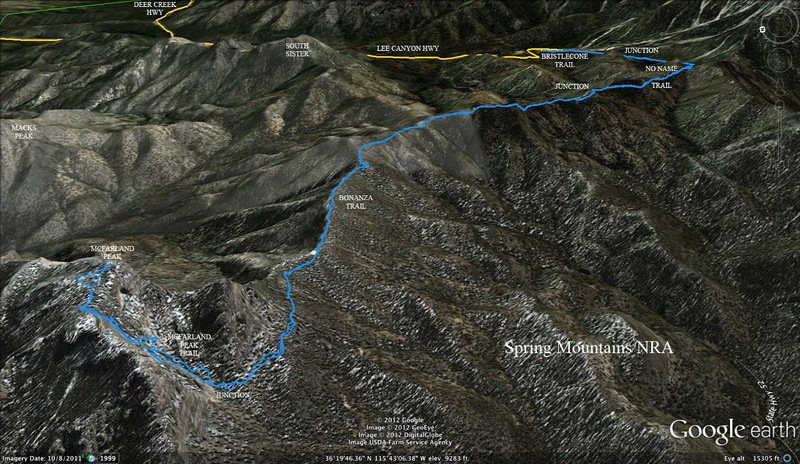 The Super Tuesday Hike today was McFarland Peak via the southern end of the Bonanza Trail. 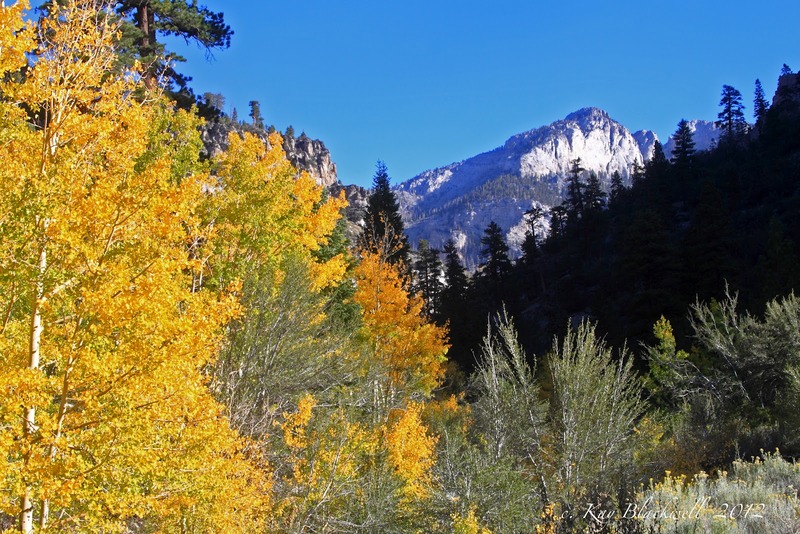 Mike OC gives us this report and two photos, Larry offers the GPS route information and Susan adds several more photos of the beautiful autumn day. An enthusiastic octet assembled at the Santa Fe in the Tuesday pre-dawn darkness. Destination: McFarland Summit. 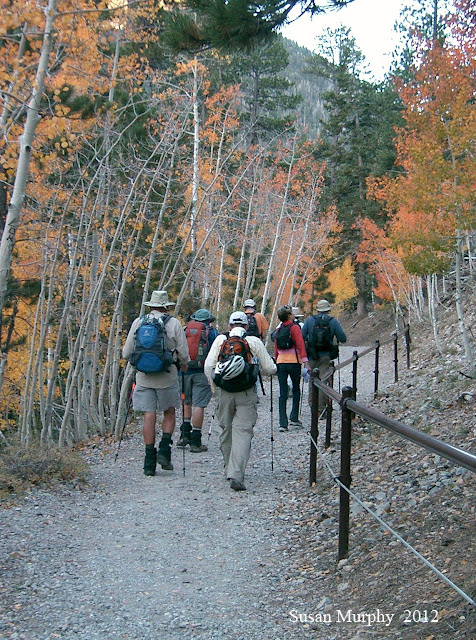 Ten hours later, a less-than-enthusiastic troupe of hikers returned to the Santa Fe. As in the previous Tuesday, today's outing developed into another marathon affair. Starting from the ski area on a 38-degree morning, the eight trekkers hammered out the five-mile approach to the McFarland Trailhead. 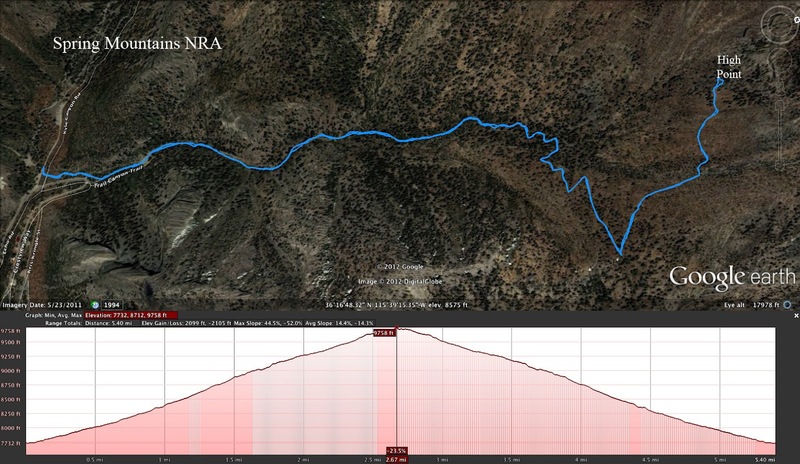 This involved a mostly uphill jaunt on the Bristlecone, No Name and Bonanza Trails. 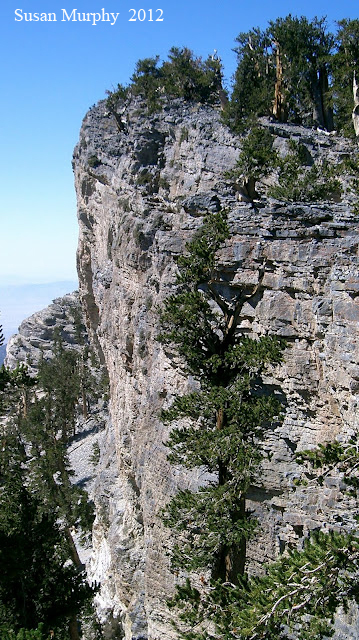 Our ultimate destination was now situated directly above us: An imposing, limestone pinnacle, McFarland Peak. 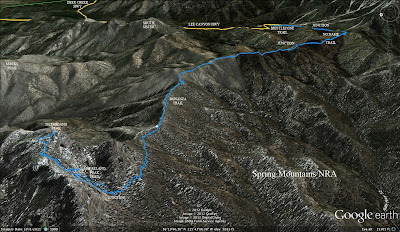 This proved to be the crux of the hike--1200 vertical feet of loose rock and dicey predicaments. 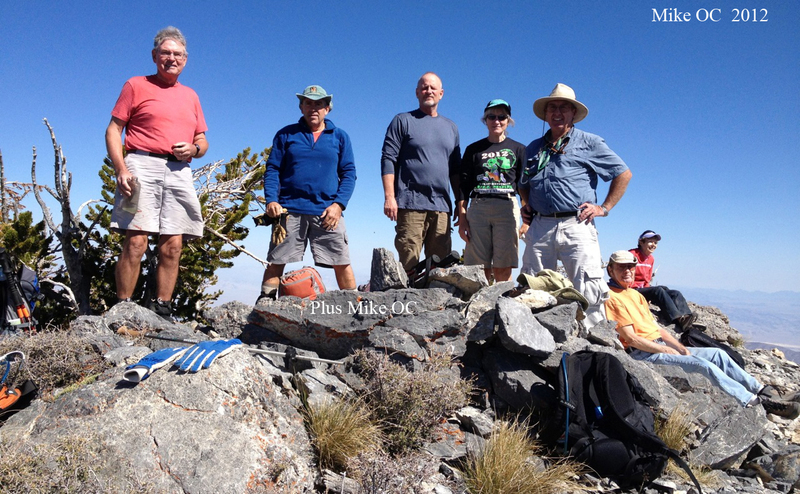 But the eight adventurers were certainly up to the task, as 75 minutes later, we all stood atop the summit. Big smiles. But the hike was only halfway over. We still had to descend. As a veteran mountaineer once observed: Getting up is optional; getting down is not. True to form, the descent proved to be as tricky as the climb. Rockfall was our constant companion as the group carefully wended their way down the hazardous chute. A couple minor scrapes and bruises later, we were back at the trailhead, again. More smiles. 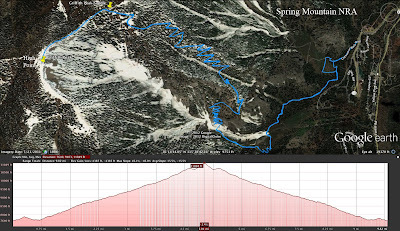 Now six hours into the hike, we still had the five-mile journey back to the ski area, which entailed another 1000 feet of vertical ascent. So off we went. Not a whole lot of conversation going back as the weary crew trudged doggedly along, one foot in front of the other. The sun was low on the horizon when we finally spied our cars and set foot on the macadam. Time to go home. It was a very cool morning at the Trail Canyon Trailhead parking area when sixteen hikers arrived to hike up to the ridge. There was a cold wind blowing a narrow cloud bank across the Spring Mountains and most of our hike going up Trail Canyon was in the shade. Jackets were donned or bare arms turned to goose flesh. 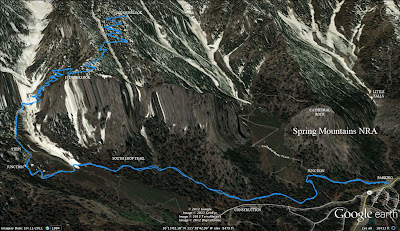 The seven hikers who planned to continue their hike all the way to Cave Springs took the lead while hoping for a warm-up. 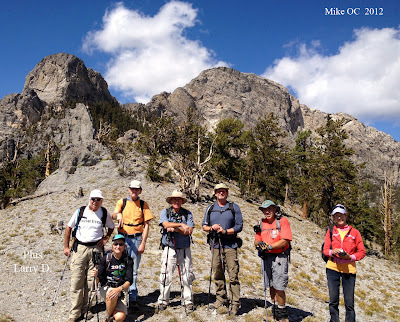 Some of the remaining hikers who planned to only hike to the Trail Canyon / North Loop Saddle Junction, turned around before they reached their goal because of the cold wind. The seven Cave Springs hikers plodded ahead after questioning themselves at the saddle. As it turned out, the distance from the saddle to the springs area was the most colorful part of the hike. 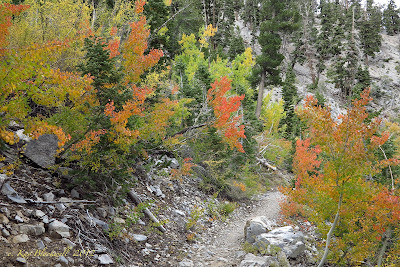 The aspens, which were still in full color, surrounded the trail here. 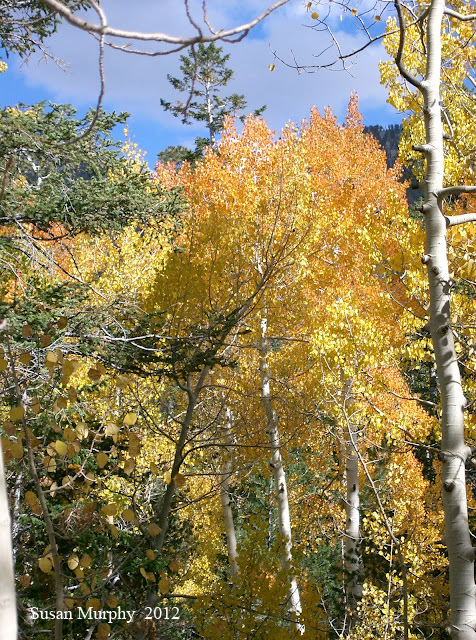 The aspens had dropped yellow leaves into the horse trough that lies below the springs. A hose runs from the springs in the caves above down to the trough carrying fresh water for animals. The water is clear and appears fresh enough to drink, however, that might not be a very good idea. We decided against taking a break due to the weather and were soon on our way back down to the cars. It was a quick six mile hike with around 2000 feet of elevation gain. 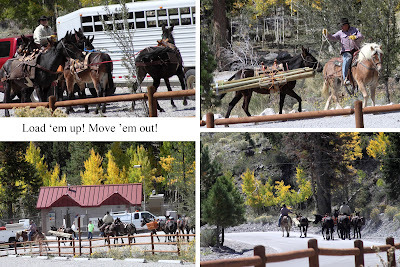 When we got back to the parking lot, a group of horses and mules were being loaded up for a mule train up to the Cathedral Rock Trail to do trail work. It was fun to watch the two cowboys handle the wary mules. One particular mule seemed to be particularly upset about his lot in life. Since all the mules were already connected, this caused the rest of the mules to be jostled around by that mule. The cowboys seemed to handle the active lot quite well! Today's hike to the second overlook of the South Loop Trail, was a continuation of the Friday Gang's training for a Mt. Charleston hike coming up in a couple of weeks. There were six hikers who arrived at the Cathedral Rock / South Loop Trailhead this morning for a relaxing hike seven miles up and back on the South Loop Trail. We hiked up the steps and turned left. Soon, we had to turn left again at the new junction for the South Loop Trail. Below us to the left, we saw a lot of construction activity as it appears that they are building a new road at the old Cathedral Rock Picnic Area. 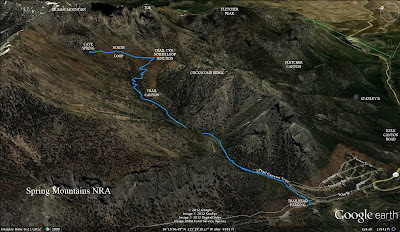 We are hoping that a larger parking lot for the Cathedral Rock and South Loop Trails are in the plans. 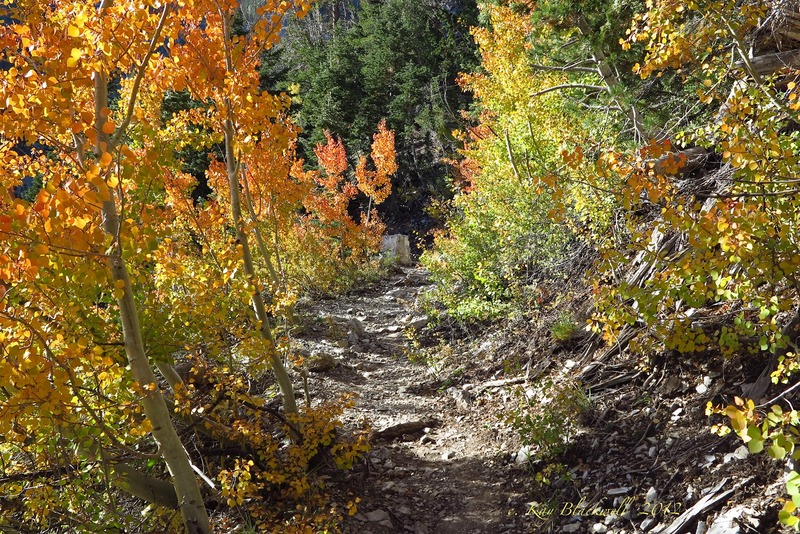 The aspens are bountiful on the South Loop Trail and, at this time, they are anywhere from green to yellow to red and orange. 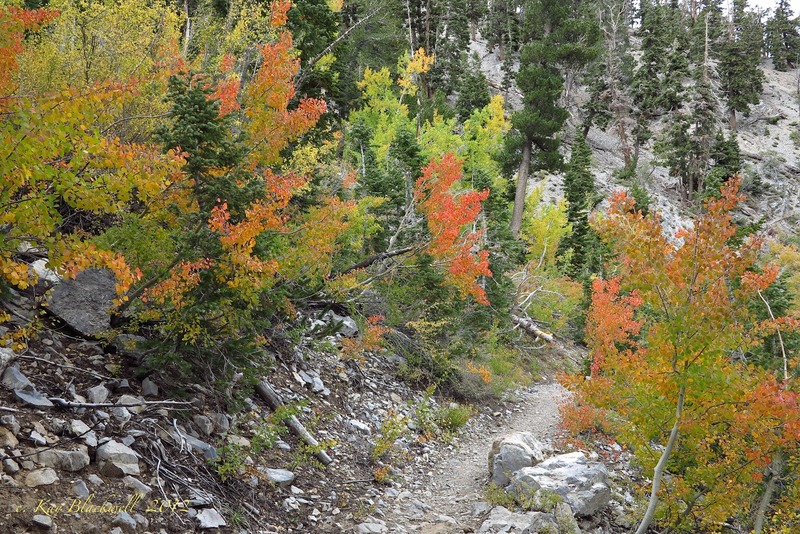 We enjoyed hiking through the colors, up the steps and up the first set of switchbacks. When we arrived at the first overlook, we saw a fire pit with a smoldering log in it. Whoever had left the fire burning did not succeed in putting it out completely. We made sure that the log was covered in rocks since there was no loose dirt nearby to put on it. None of us wanted to use our valuable water to put the smoke out until we were on our way back down. 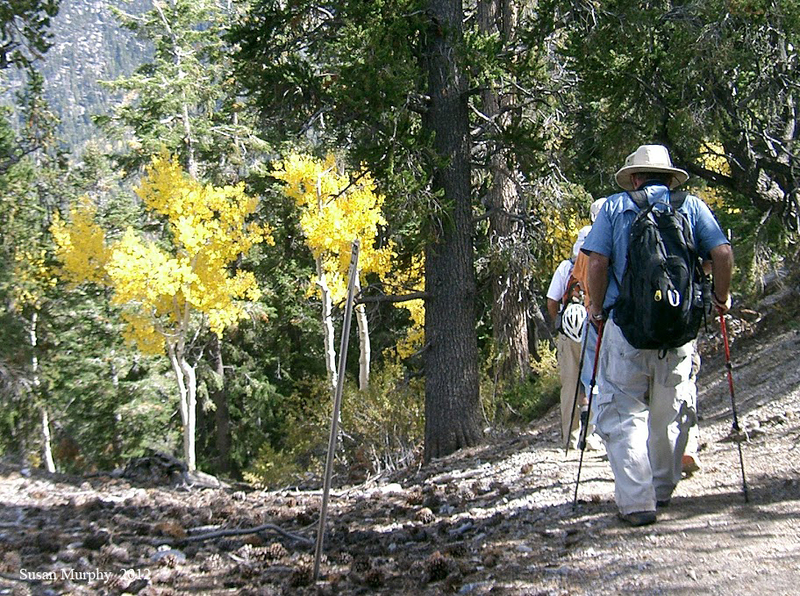 From the beginning of the hike, we were separated into a group of four and a group of two. We waited at the overlook for the second group a few minutes then decided to continue on up. 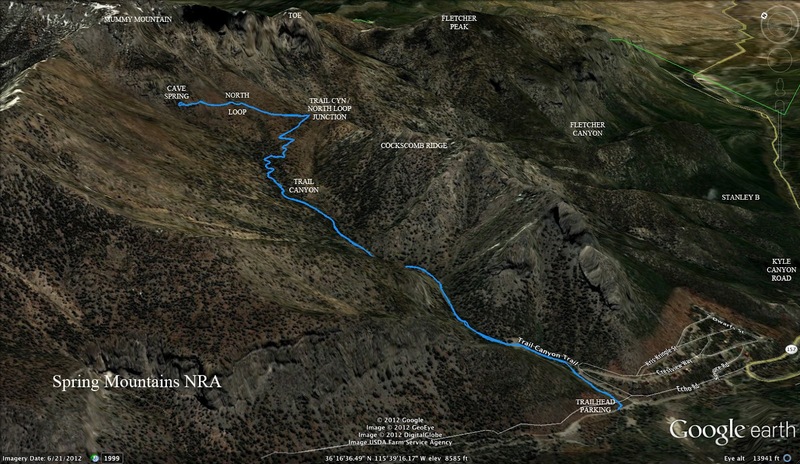 Several more long switchbacks took us into the Mt. Charleston Wilderness and up to the second overlook. Here, there was a nice place to sit and take a break. 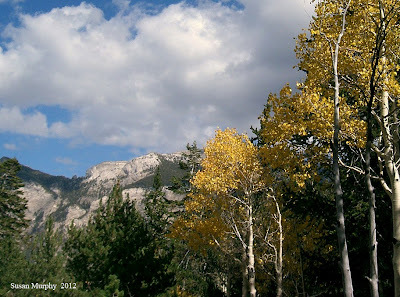 We took several photos of Kyle Canyon, Mummy's Toe, orange and yellow aspen groves, and Mt. Charleston from the surrounding cliffs. After we settled down with our break, the second group of two hikers arrived. We took a "summit" photo then started back down without waiting much longer. Going down, the group separated into two groups of three hikers. 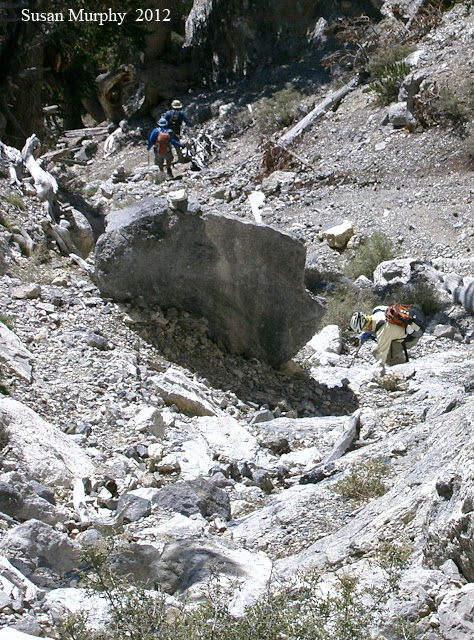 On the way down, the second group stopped at the rock on the first set of switchbacks that is covered with seabed fossils as seen to the right. It never ceases to amaze that this area reaching 9000 feet plus above sea level is so abundantly covered in fossils of creatures that once lived so far below the water's surface. 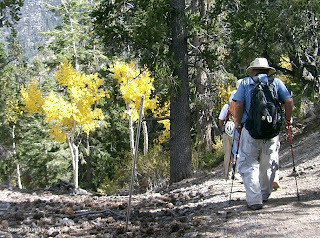 We continued back down to the cars at a steady pace enjoying the colors of autumn.